Download "Online Payments. About your payments: Overpayments and refunds:"
1 Online Payments Terms and Conditions Please read these terms carefully before using the online payment facility. Using the online payment facility on this website indicates that you accept these terms. If you do not accept these terms do not use this facility. These Terms and Conditions are governed by and to be construed in accordance with English law. Any disputes shall be subject to the exclusive jurisdiction of the English courts. About your payments: This site is for payments made by, or on behalf of, Students who are registered with the University. Your payment will normally reach your University account within three working days. Please ensure that you enter your details accurately we cannot accept liability for payment not reaching the correct University account due to you entering incorrect details. We cannot accept liability if payment is refused by your card issuer for any reason you should address any refusal through your card issuer. Please note that we will not be in a position to inform you if your card issuer declines payment; if in doubt, you should check that the payment has been deducted from your account through your card issuer. In no event will the University be liable for any damages whatsoever arising out of the use, inability to use, or the results of use of this site, any websites linked to this site, or the materials or information contained at any or all such sites, whether based on warranty, contract, tort or any other legal theory and whether or not advised of the possibility of such damages. Refunds, if applicable, will only be made to the debit/credit card used for the original transaction. 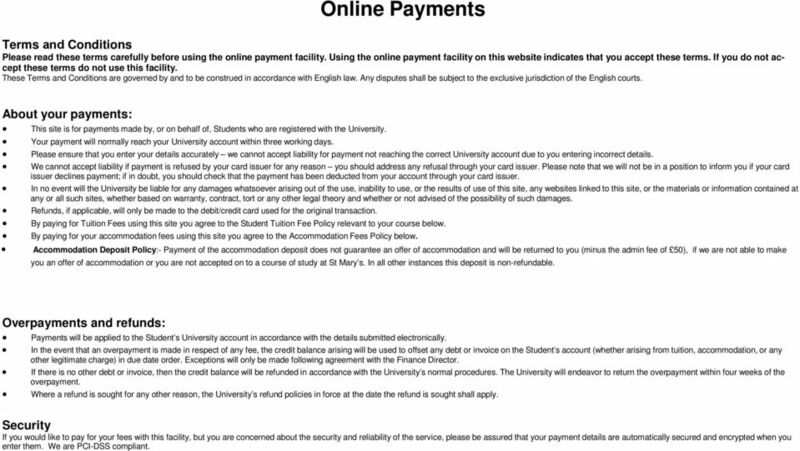 By paying for Tuition Fees using this site you agree to the Student Tuition Fee Policy relevant to your course below. By paying for your accommodation fees using this site you agree to the Accommodation Fees Policy below. 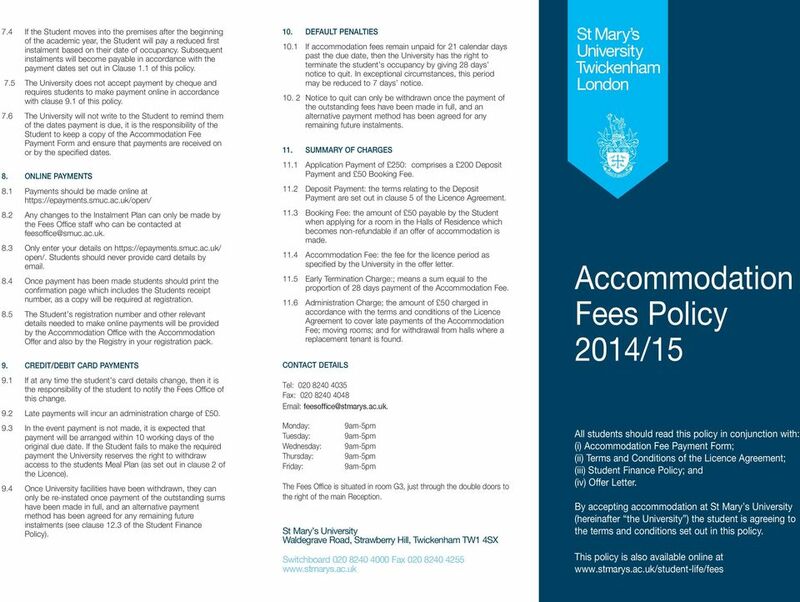 Accommodation Deposit Policy:- Payment of the accommodation deposit does not guarantee an offer of accommodation and will be returned to you (minus the admin fee of 50), if we are not able to make you an offer of accommodation or you are not accepted on to a course of study at St Mary s. In all other instances this deposit is non-refundable. Overpayments and refunds: Payments will be applied to the Student s University account in accordance with the details submitted electronically. In the event that an overpayment is made in respect of any fee, the credit balance arising will be used to offset any debt or invoice on the Student s account (whether arising from tuition, accommodation, or any other legitimate charge) in due date order. Exceptions will only be made following agreement with the Finance Director. If there is no other debt or invoice, then the credit balance will be refunded in accordance with the University s normal procedures. The University will endeavor to return the overpayment within four weeks of the overpayment. Where a refund is sought for any other reason, the University s refund policies in force at the date the refund is sought shall apply. Security If you would like to pay for your fees with this facility, but you are concerned about the security and reliability of the service, please be assured that your payment details are automatically secured and encrypted when you enter them. We are PCI-DSS compliant. 5 12. Online Payments 12.1 Payment should be made online at Any alterations to the instalment plan can only be made by the Fees Office staff who can be contacted at 12.3 Only enter your details on Never card details You must provide your registration number and date of birth to access the payment screen Your registration number is six digits long and begins with your first year of study Please print the confirmation page which includes your receipt number and keep this with your records. You will also need to bring a copy of this to registration Your registration number will be provided by Registry in your registration pack sent in August Subject to clauses and below, the University reserves the right to withhold the degree certificate and/or re-registration of any Student that has outstanding tuition fees to the University from a previous academic year Before exercising the right to withhold a Student s degree certificate and/or re-registration, the University will discuss the matter with the Student, and will give due consideration to the circumstances in which the outstanding tuition fees have arisen (including the amount of any outstanding sums) For the avoidance of doubt, the exercise, or otherwise, of the University s right to withhold a Student s degree certificate and/or reregistration, as set out in clause 14.4 above, does not remove, or restrict, a Student s statutory right to obtain information about their results or grades under the Data Protection Act If a Student fails to pay their fees promptly, the Registrar reserves the right to terminate the Student s programme on the advice of the Finance Department 13. Credit/Debit Card Payments 13.1 If at any time your card details change, then it is your responsibility to notify the Fees Office of this change Following a dishonoured payment, it is expected that you will arrange payment using cleared funds within 10 working days of the original due date. If you fail to do this then a 50 Late Payment Administration Charge will be applied. 14. Debtor Policy and Default Penalties 14.1 A Late Payment Administration Charge will be applied to your University account if payment remains outstanding 10 working days after the original due by date. Late Payment Administration Charge Following a dishonoured payment, it is expected that you will arrange payment using cleared funds within 10 working days of the original due date. If you fail to do this then your University facilities, which include access to the Learning Resource Centre and computer facilities, may be withdrawn Once University facilities have been withdrawn they can only be re-instated once payment of the outstanding debt has been made in full, and an alternative payment method has been agreed for any remaining future instalments. Useful Contacts Telephone: Fees Office Opening Hours Monday-Friday: 9am-5pm The Fees Office is situated in room G3, just through double doors to the right of the main Reception. 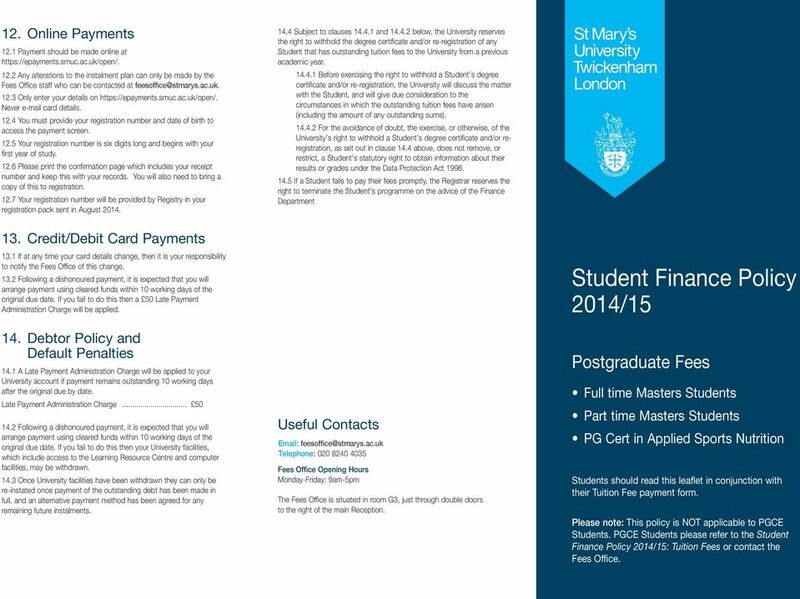 Student Finance Policy 2014/15 Postgraduate Fees Full time Masters Students Part time Masters Students PG Cert in Applied Sports Nutrition Students should read this leaflet in conjunction with their Tuition Fee payment form. Please note: This policy is NOT applicable to PGCE Students. 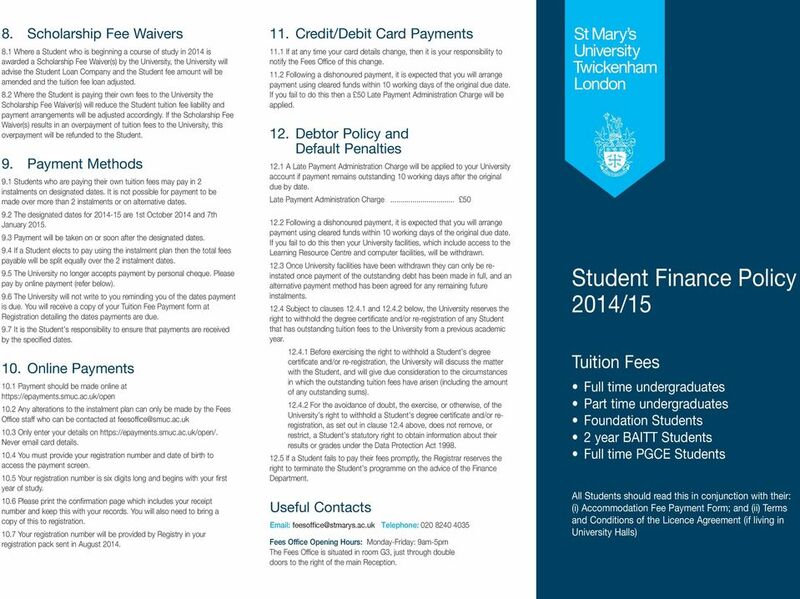 PGCE Students please refer to the Student Finance Policy 2014/15: Tuition Fees or contact the Fees Office. 6 1. Tuition Fees 1.1 All fees shown are for the academic year 2014/15 only. All fees are subject to an inflationary increase in subsequent years. 1.2 Students can only register and pay for modules undertaken and completed during the academic year 2014/ Career Development Loan 2.1 Students who are in receipt of a Career Development Loan, payment of the loan will be made directly to the University by the lender. 2.2 Students will need to ensure that a copy of the loan agreement is provided together with the Tuition Fee Payment form at Registration. 2.3 If at Registration a Student is unable to provide a copy of the Career Development Loan agreement, then the full fee liability will remain with the Student, and as such, the Student will be required to make payment arrangements in order to register. 2.4 If a Student takes out a Career Development Loan that covers only part of the fees due for the academic year 2014/15, then the Student must provide a method of payment for the remaining balance of fees due. 2.5 In the event that the lender fails to pay the amount specified in the Career Development Loan agreement, the fee liability will revert to the Student, who will be required to make arrangements to pay any outstanding fees in full. 3. Sponsorship 3.1 Students whose fees are to be paid by a sponsor will need to provide an official letter of sponsorship together with the Tuition Fee Payment form at Registration. 3.2 If at Registration a Student is unable to provide a copy of an official letter confirming sponsorship, then the full fee liability will remain with the Student, and as such, the Student will be required to make payment arrangements in order to register. 3.3 An official letter of sponsorship must contain the following information: Name of Student Name of Sponsor (individual/company) Contact details for sponsor Total amount the sponsor is to pay for the academic year 2014/15 Letters should be on headed paper and/or stamped. 3.4 If a sponsor agrees to pay only part of the fees due for the academic year 2014/15, then the Student must provide a method of payment for the remaining balance of fees due. 3.5 The University will invoice the sponsor directly for the fee amount outlined in the official letter of sponsorship. 4. Alumni Students 4.1 Former Students of the University who started a Masters course in September 2012 or later are entitled to a 10% discount on their tuition fees. This will be deducted from the amount due for the 2014/15 academic year. 5. Exemptions MA in Catholic School Leadership 5.1 Students who have attained an NPQH Qualification are entitled to a 15 credit exemption from two modules, RTM22 and RTM24 upon provision of a NPQH certificate. 5.2 Students who are able to provide the NPQH certificate will be entitled to a 50% reduction in fees for these two modules. 5.3 Students who hold the NCSL Leading from the Middle Qualification or the NCSL Leadership Pathways Qualification are entitled to a 15 credit exemption which applies to the assignment for either module RTM22 or RTM24 upon provision of the appropriate certificate. This will also entitle a Student to a 50% reduction in the fee for that module. 5.4 A full exemption from RTM21 and RTM22 is available to Students who have gained 60 credits from the Catholic Leadership Programme offered by the Diocese of Salford. 5.5 A full exemption from RTM24 is available for Students who have gained a Post Graduate Certificate in Education (PGCE) with 60 credits at M-level. 6. Deposits 6.1 A non-refundable deposit of 500 is payable upon application for the MA in Sports Journalism. 6.2 If a Student s application is accepted and the Student does not then take up the place offered, the deposit of 500 will be forfeited. 6.3 If a Student accepts the offer and attends the course, the deposit of 500 will be applied against their 2014/15 tuition fees. 6.4 A non-refundable deposit of 250 is payable on application for the MA in Physical Theatre. 6.5 If a Student s application is accepted and the Student does not then take up the place offered, the deposit of 250 will be forfeited. 6.6 If the Student accepts the offer and attends the course, the deposit of 250 will be applied against their 2014/15 tuition fees. 7. Associate Students 7.1 Any module taken by an Associate Student will be charged at the full module rate. 8. Auditing Students 8.1 Any module audited will be charged at 50% of the module fee. 8.2 An annual registration fee of 50 will apply to all auditing Students, except those Students already registered on a full or part time course of study at St Mary s University. 9. Withdrawal/Suspension of Study 9.1 If a Student decides to either withdraw or suspend his/her studies, or if the University terminates or suspends a Student s course of study, during the academic year 2014/15, then the Student will be required to pay the full fee for any module where the Student has attended any part of the module. 10. Repeat Study 10.1 Students who are repeating any module(s) will be charged the full rate applicable for any module being repeated. Further information on costs per module is available upon request from the Fees Office. 11. 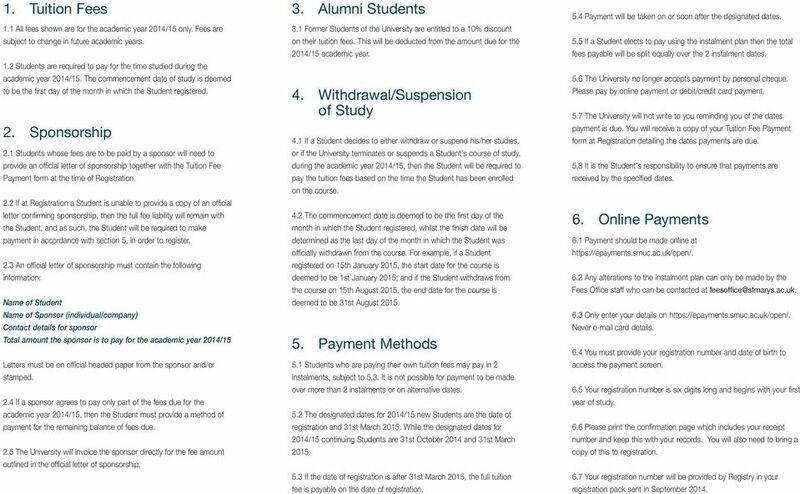 Payment Methods 11.1 Students who are paying their own tuition fees may pay in 2 instalments on the designated dates. It is not possible for payment to be made over more than 2 instalments or on alternative dates The designated dates for 2014/15 are 1st October 2014 and 7th January Payment will be taken on or soon after the designated dates If a Student elects to pay using the instalment plan then the total fees payable will be split equally over the 2 instalment dates The University no longer accepts payment by personal cheque. Please pay by online payment or debit/credit card payment The University will not write to you reminding you of the dates payment is due. You will receive a copy of your Tuition Fee Payment form at Registration detailing the dates payments are due It is the Student s responsibility to ensure that payments are received by the specified dates. 7 7. Credit/Debit Card Payments 7.1 If at any time your card details change, then it is your responsibility to notify the Fees Office of this change. 7.2 Following a dishonoured payment, it is expected that you will arrange payment using cleared funds within 10 working days of the original due date. If you fail to do this then a 50 Late Payment Administration Charge will be applied. 8. Debtor Policy and Default Penalties Before exercising the right to withhold a Student s degree certificate and/or re-registration, the University will discuss the matter with the Student, and will give due consideration to the circumstances in which the outstanding tuition fees have arisen (including the amount of any outstanding sums) For the avoidance of doubt, the exercise, or otherwise, of the University s right to withhold a Student s degree certificate and/or reregistration, as set out in clause 8.4 above, does not remove, or restrict, a Student s statutory right to obtain information about their results or grades under the Data Protection Act If a Student fails to pay their fees promptly, the Registrar reserves the right to terminate the Student s programme on the advice of the Finance Department 8.1 A Late Payment Administration Charge will be applied to your University account if payment remains outstanding 10 working days after the original due by date. Late Payment Administration Charge Following a dishonoured payment, it is expected that you will arrange payment using cleared funds within 10 working days of the original due date. If you fail to do this then your University facilities, which include access to the Learning Resources Centre and computer facilities, may be withdrawn. 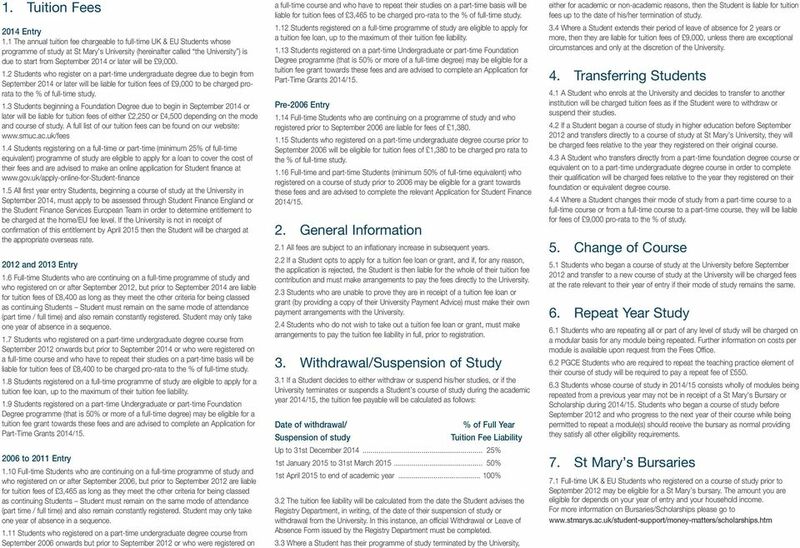 8.3 Once University facilities have been withdrawn they can only be reinstated once payment of the outstanding debt has been made in full, and an alternative payment method has been agreed for any remaining future instalments. 8.4 Subject to clauses and below, the University reserves the right to withhold the degree certificate and/or re-registration of any Student that has outstanding tuition fees to the University from a previous academic year. Useful Contacts Telephone: Fees Office Opening Hours Monday-Friday: 9am-5pm The Fees Office is situated in room G3, just through double doors to the right of the main Reception. 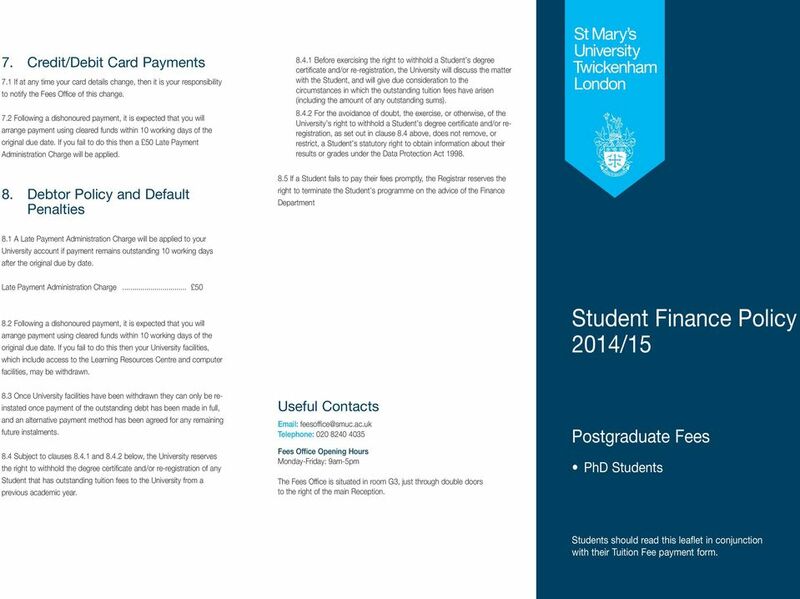 Student Finance Policy 2014/15 Postgraduate Fees PhD Students Students should read this leaflet in conjunction with their Tuition Fee payment form. 8 1. Tuition Fees 1.1 All fees shown are for the academic year 2014/15 only. Fees are subject to change in future academic years. 1.2 Students are required to pay for the time studied during the academic year 2014/15. The commencement date of study is deemed to be the first day of the month in which the Student registered. 2. Sponsorship 2.1 Students whose fees are to be paid by a sponsor will need to provide an official letter of sponsorship together with the Tuition Fee Payment form at the time of Registration. 2.2 If at Registration a Student is unable to provide a copy of an official letter confirming sponsorship, then the full fee liability will remain with the Student, and as such, the Student will be required to make payment in accordance with section 5, in order to register. 2.3 An official letter of sponsorship must contain the following information: Name of Student Name of Sponsor (individual/company) Contact details for sponsor Total amount the sponsor is to pay for the academic year 2014/15 Letters must be on official headed paper from the sponsor and/or stamped. 2.4 If a sponsor agrees to pay only part of the fees due for the academic year 2014/15, then the Student must provide a method of payment for the remaining balance of fees due. 2.5 The University will invoice the sponsor directly for the fee amount outlined in the official letter of sponsorship. 3. Alumni Students 3.1 Former Students of the University are entitled to a 10% discount on their tuition fees. This will be deducted from the amount due for the 2014/15 academic year. 4. Withdrawal/Suspension of Study 4.1 If a Student decides to either withdraw or suspend his/her studies, or if the University terminates or suspends a Student s course of study, during the academic year 2014/15, then the Student will be required to pay the tuition fees based on the time the Student has been enrolled on the course. 4.2 The commencement date is deemed to be the first day of the month in which the Student registered, whilst the finish date will be determined as the last day of the month in which the Student was officially withdrawn from the course. For example, if a Student registered on 15th January 2015, the start date for the course is deemed to be 1st January 2015; and if the Student withdraws from the course on 15th August 2015, the end date for the course is deemed to be 31st August Payment Methods 5.1 Students who are paying their own tuition fees may pay in 2 instalments, subject to 5.3. It is not possible for payment to be made over more than 2 instalments or on alternative dates. 5.2 The designated dates for 2014/15 new Students are the date of registration and 31st March While the designated dates for 2014/15 continuing Students are 31st October 2014 and 31st March If the date of registration is after 31st March 2015, the full tuition fee is payable on the date of registration. 5.4 Payment will be taken on or soon after the designated dates. 5.5 If a Student elects to pay using the instalment plan then the total fees payable will be split equally over the 2 instalment dates. 5.6 The University no longer accepts payment by personal cheque. Please pay by online payment or debit/credit card payment. 5.7 The University will not write to you reminding you of the dates payment is due. You will receive a copy of your Tuition Fee Payment form at Registration detailing the dates payments are due. 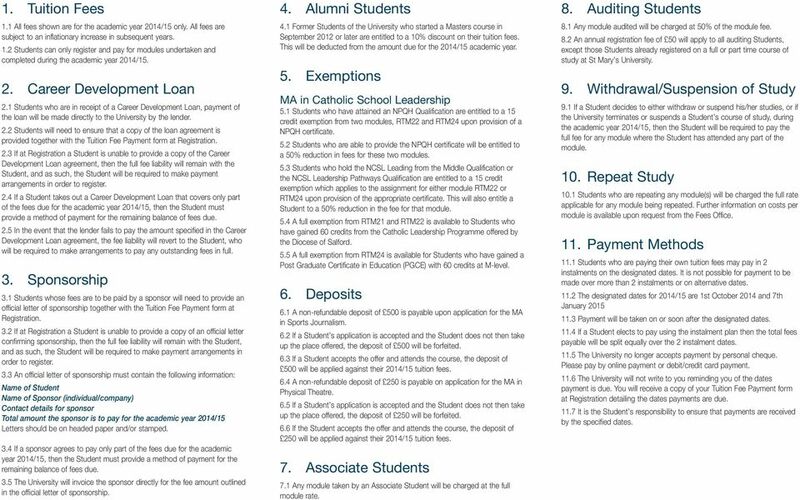 5.8 It is the Student s responsibility to ensure that payments are received by the specified dates. 6. Online Payments 6.1 Payment should be made online at Any alterations to the instalment plan can only be made by the Fees Office staff who can be contacted at 6.3 Only enter your details on Never card details. 6.4 You must provide your registration number and date of birth to access the payment screen. 6.5 Your registration number is six digits long and begins with your first year of study. 6.6 Please print the confirmation page which includes your receipt number and keep this with your records. You will also need to bring a copy of this to registration. 6.7 Your registration number will be provided by Registry in your registration pack sent in September 2014. 10 1. ACCOMMODATION FEES 1.1 Students are required to pay the Accommodation Fees for the period specified in the Allocation Letter in accordance with the terms and conditions set out in the On-Campus Student Accommodation Licence Agreement ( the Licence ). The University allows the Accommodation Fees ( the Fees ) to be paid in total at the outset, or in three instalments ( the Instalment Plan ) on the dates specified below: (i) Payment 1 1st October 2014 (ii) Payment 2 7th January 2015 (ii) Payment 3 7th April Students will not be admitted or re-admitted to University accommodation unless all outstanding fees are settled. 1.3 The total charge is payable whether or not you occupy the premises for the period specified, as stated in clause 2.4 of the Licence, unless the University varies the specified period in writing. 1.4 The Fees include lighting, water, reasonable use of heating without further charge, internet, contents insurance and the meal plan (use of the internet nor the meal plan is available to students in Benedict House). 1.5 Students will not be allowed to occupy the premises without having either paid all accommodation fees in full, or having an accommodation fee instalment payment plan in place. 2. HOW THE INSTALMENT PLAN WORKS 2.1 The instalment plan splits the total cost of the Licence period over three instalments to be paid on the dates specified at clause 1.1, there is some flexibility of the date of the first instalment if the Student can provide evidence of their student loan being delayed. 2.2 The instalments do not reflect the number of nights in Hall per term. 2.3 Nightly rates are available upon request from the Accommodation Officer. 3. CLOSURE PERIODS 3.1 Students are not allowed to remain in accommodation during the Christmas closure period. 3.2 Students must vacate their accommodation on Sunday 21st December 2014 by 12 noon (with the exception of 16 Strawberry Hill Road). 3.3 Students may return to their accommodation on Saturday 3rd January DEPOSIT 4.1 Students are required to pay an Application Fee of 250 at the time of applying for a place in halls of residence. This payment comprises of: (i) a 200 Deposit Payment; and (ii) a booking fee of 50, this fee is non-refundable if an offer of accommodation is made. 4.2 The Deposit Payment, less any deductions in accordance with Clause 5 of the Licence and clause 5.5 herein if applicable, will be returned within 45 days of the Licence period ending. 4.3 The Deposit Payment will be returned by way of BACS transfer to the account details provided on the Accommodation Fees Payment Form. 5. REFUNDS/CANCELLATION Refunds 5.1 All Students with an offer of accommodation who are not accepted on to a course of study at the University or who decline their offer of accommodation will be automatically entitled to a refund of the 200 Deposit Payment. 5.2 Students who do not accept their offer of accommodation within the stated timescales will have their offer withdrawn and Deposit Payment of 200 refunded. 5.3 Students who do not receive an offer of accommodation will be entitled to a full refund of the 250 Application Fee. Withdrawal from Halls Only 5.4 Subject to clause 5.5 below, should the Student leave the accommodation voluntarily before the expiration of the Licence period but still remain a registered Student of the University, the Student will remain liable for the Fees for the remainder of the academic year. 5.5 If the University is able to re-let the Student s room, the Student will be charged a proportionate amount up to the date the room is re-let and it will incur a 50 administration charge, this will be deducted from the Deposit Payment, or from any refund that may be due. Withdrawal from University and Halls 5.6 If the Student ceases to be a registered full time Student of the University and has informed the Accommodation Office, the Student will be released from the Licence from either the date he/she ceases to be a full-time Student or the date he/she vacates the room and the keys are returned to the Accommodation Office, whichever is later. 5.7 The Student will incur an Early Termination Charge equivalent to 28 days at the student s daily accommodation fee rate (to cover the costs of the release) which will be deducted from the Deposit Payment, or from any refund that may be due. 5.8 Notice of a Student s withdrawal from the University and halls will not be deemed to have been accepted if it is given within the Christmas closure period. 5.9 It is important that once the Student decides to leave Halls and/or University that he/she reports to the Fees Office, so that outstanding fees can be calculated, payment arranged and any refunds made, if applicable. Licence Terminated by the University 5.10 Subject to clause 3.3 of the Licence, Students whose Licence is terminated due to serious or persistent breaches of the obligations under the Licence or as a consequence of the outcome of a disciplinary process, will still liable for the Fees for the remainder of the academic year If the University is able to re-let the Student s room, the Student will be charged up to the date the room is re-let and will incur an Early Termination Charge equivalent to 28 days at the Student s daily accommodation fee rate. This will be deducted from the Student s Deposit Payment, or from any refund that may be due. 6. ROOM CHANGES 6.1 In certain circumstances the Student may be allowed to change rooms with the prior approval of the Resident Mentor and the Accommodation Officer. If consent is given an administration charge of 50 will apply. 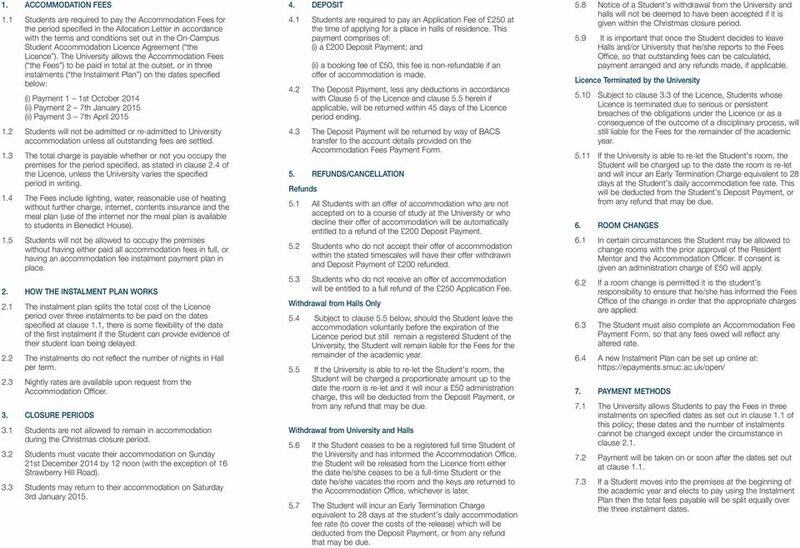 6.2 If a room change is permitted it is the student s responsibility to ensure that he/she has informed the Fees Office of the change in order that the appropriate charges are applied. 6.3 The Student must also complete an Accommodation Fee Payment Form, so that any fees owed will reflect any altered rate. 6.4 A new Instalment Plan can be set up online at: 7. PAYMENT METHODS 7.1 The University allows Students to pay the Fees in three instalments on specified dates as set out in clause 1.1 of this policy; these dates and the number of instalments cannot be changed except under the circumstance in clause Payment will be taken on or soon after the dates set out at clause If a Student moves into the premises at the beginning of the academic year and elects to pay using the Instalment Plan then the total fees payable will be split equally over the three instalment dates. If you are unclear about the implications of Auto Enrolment you will find our Guide to Auto Enrolment a good starting point. Essex Recruitment Services: Terms of Engagement of Limited Company Contractors to Supply Workers to Clients (Opted Out) 1. Definitions 1. If you would like to view a version of these terms and conditions in a larger text size, you can download them at www.depositprotection. TERMS & CONDITIONS FULLY MANAGED SERVICE For the purpose of this agreement the following definitions will apply:- Keywest Estate Agents Ltd shall be known as The Agent... shall be known as The Owner..